These cords will work on any RCA machine, and have a great ninety degree bend on the machine end which helps keep the cord out of your way while working. It's heavy duty and attractively made. Many artists have immediately noticed the difference made by the bend in the cord, which just makes a lot of sense. 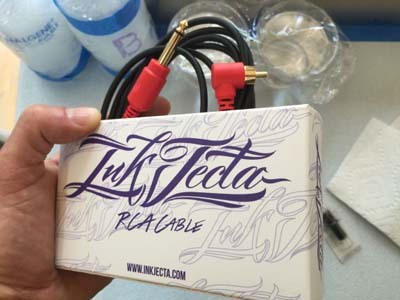 Made in Australia by the people who brought you the InkJecta machine, although it will work on any RCA equipped tattoo machine.